In sharp contrast to the trend in tea prices, coffee prices have been falling in fiscal 2010. In the previous year, bumper coffee crops in two major producing countries—Brazil and Vietnam —led to a decline in prices. The global economic slowdown affected consumption and also hit the export trade. A key factor affecting prices is Brazil’s projected fall in production. The US department of agriculture’s Foreign Agricultural Service estimates Brazil’s coffee production to fall by 15% in the marketing year for 2010 (July-June). The International Coffee Organization (ICO) expects the crop in Vietnam, too, to be lower due to bad weather, while Colombia, another large producer, is not seeing production at normal levels. These initial signs are having their impact on prices. The ICO composite price is averaging 119 cents/lb in November, up by 10% over a year ago. Growing global consumption and favourable market conditions are expected to keep prices high during the current season. But the impact on the Indian industry is not immediate. While arabica coffee prices have been rising, robusta has not moved up, and in fact has fallen further in November. India’s coffee production is dominated by the robusta variety, contributing nearly 70% of the production. The impact on domestic companies will vary depending on their product mix and position in the value chain. For plantation companies, the current price levels mean lower realizations, though a higher crop prediction could mean higher volumes. The Coffee Board has projected coffee production initially at 306,300 tonnes in 2010, up 4.5% over last year. This estimate may change later, however. Branded coffee companies will benefit from lower prices, as they had hiked their prices in earlier years when coffee prices were high. During calendar year 2008, Nestle India Ltd’s coffee realizations were higher by 11%. When green coffee prices decline, branded companies hold on to prices, instead offering free volumes or other promotions to retain customers. But if the price differential widens beyond a limit, then consumers start shifting to regional or local brands. At that point, companies will be forced to start lowering prices, which will hurt their sales revenue. Till then, it would appear that lower coffee prices will bring benefits to Indian coffee producers in the form of higher margins. Coffee consumption in the country too has been increasing at about 5% per annum. 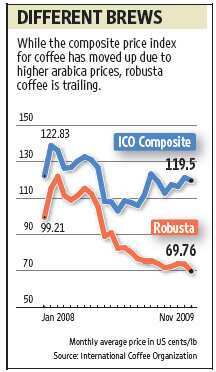 The risk to their performance is when robusta coffee too reverses trend to follow Arabica’s upward march.